Los Altos, CA and Cambridge, MA (February 17, 2016). Genome Compiler Corp., a Los Altos based synthetic biology software company entered into a collaborative agreement with Lucigen Corporation, a supplier of advanced molecular biology products, located in Middleton, WI. 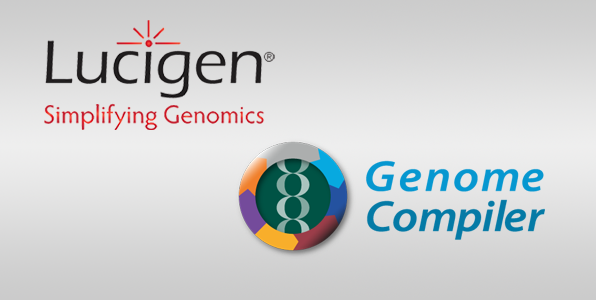 Genome Compiler will be integrating Lucigen's pJAZZ and pSMART cloning vectors into its advanced design tools and marketplace platform, enabling users to visualize, design, and seamlessly order Lucigen's repository of unique cloning vectors. By integrating Lucigen's cloning vectors collection, Genome Compiler enhances its repositories of vectors, plasmids, and parts available on the software, allowing users to research, design, and directly retrieve data – on the Genome Compiler's All-in-One software platform. “Sharing a forward-looking vision, Lucigen and Genome Compiler have cooperated towards a common goal: providing a streamlined process in order to further improve the life science researchers' experience", said Omri Drory, CEO of Genome Compiler. “We are excited to collaborate with Genome Compiler by integrating our cloning vectors on their platform,” said Angela Ryan, VP of Marketing at Lucigen. “It will enable our customers to purchase and use our vectors in a simple streamlined process." Lucigen pJAZZ cloning vectors provide unprecedented ability to clone large, difficult, repetitive, or tandem DNA sequences for users who are constructing complicated pathways. For less challenging projects, the pSMART vectors offer many advantages over traditional pUC type vectors for cloning most other targets, including AT-rich DNA or cDNAs. Based in Los Altos, CA and Tel-Aviv, Israel. Genome Compiler is a leader in computer aided design and collaboration platforms for the synthetic biology industry. Genome Compiler’s CAD tool and marketplace platform allows scientists in the biotechnology, agriculture and pharmaceutical industries to design, debug and compile biological code, to develop better bio-based products faster. Lucigen discovers, manufactures, and commercializes molecular biology products used across the spectrum from basic research to molecular diagnostics, including point of care. Founded in Wisconsin in 1998, Lucigen built on the discovery of a novel thermostable DNA/RNA polymerase from the hot springs in Yellowstone. Today, the products and services developed at Lucigen enable life-science professionals to perform their research and testing more efficiently and effectively. The company has grown to manufacture and sell over 130 biomedical research products and services to customers worldwide. Core competencies include enzyme evolution, protein expression, cloning, competent cells, NGS, and molecular diagnostics.